1. Bridge to Terabithia (Katherine Paterson) – Such a great book... definitely deserves a review! 4. Persepolis (Marjane Satrapi) – With our limited experience in the world of graphic novels, we found it difficult to capture the brilliance of this book in written form. We have this grand vision to do the review in graphic novel form... stay tuned! 5. The Help (Kathryn Stockett) – In our defense, this one was a recent read and we’re still waiting to see the movie so that we can incorporate our thoughts. No excuses... our babysitters have been busy. 6. Memoirs of a Geisha (Arthur Golden) – Here’s another one that we thought had already been reviewed. It’s probably been on so many top 10 lists that we got confused. 9. Guards! Guards! (Terry Pratchett) – Our opinion of the Discworld series after book 1 and book 2 represents one of the more epic flip-flops in the history of literature. The series is officially off probation and we plan to read and review every Discworld book we can get our hands on! 10. Neverwhere (Neil Gaiman) – Each month this book shows up on our elaborate whiteboard as a potential review (actually, it’s more like a scrap piece of paper), and yet each month this one gets passed up. Not sure why. Oooh, great list! Ender's Game and Bridge to Terabithia are two of my favourites too. When you get to reviewing Persepolis, check out Anya's Ghost too! They're not related at all except by being graphic novels, but Anya's Ghost reminded me of the first a little bit. 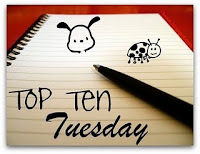 Check out my Top Ten list over here. I must read Guard! Guards! as I am now officially a Pratchett fan. I'm not sure what you meant about the first two books of the series. Were they not as good as the others? Great list! So hard to review Terry Pratchett books, at least for me, but they are such a fun read! I look forward to your Dark Tower thoughts. It looks like we may be the opposite on our feelings toward 2 and 3. :) I *finally* started 5 the other day but got caught up in my other reads. i LOVEd memoirs of a geisha and read it before i started my blog, its one ill have to re-read someday. ill be checking out enders game, i have been recommened that book so many times. Another great list. I loved THE CURIOUS INCIDENT OF THE DOG IN THE NIGHT-TIME but didn't add it to my list because I'd talked about it on the blog recently. A wonderful book. I've been meaning to read Orson Scott Card and Terry Prachett. Thanks for the push. I don't really remember Bridge to Terebithia, but I remember loving it as a kid. Persepolis is my favorite graphic novel, I think. Gotta love Pratchett. I've seen a couple film adaptations of several of the books, and just recently started the stories revolving around Tiffany (the witch) -- such great, hysterical stories. Memoirs of a Geisha was really good, and the movie was pretty decent. Beautiful imagery.